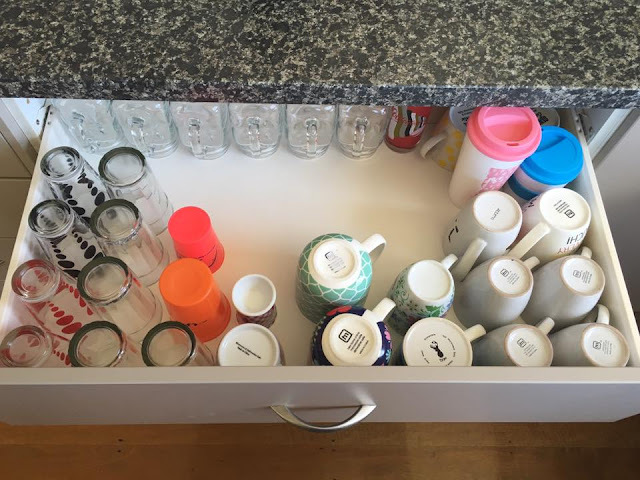 When we moved into our new home (August 2015), I wanted a fresh start and that meant getting rid of all of our old plates and cups (minus a couple of our favourite mugs and a few glasses). I bought a new dinner set which included 6 plates, 6 side plates, 6 bowls, 6 glasses, 6 cups and a set of cutlery - everything we needed for our family of four, plus a couple of extras. As you can see, our cup/glasses drawer was in need of a clean out and a bit of re-organisation. So I pulled everything out and grouped like things together and returned the cups/glasses that 'sparked joy' or I was happy to keep. Well it ended up being all of them but 4. 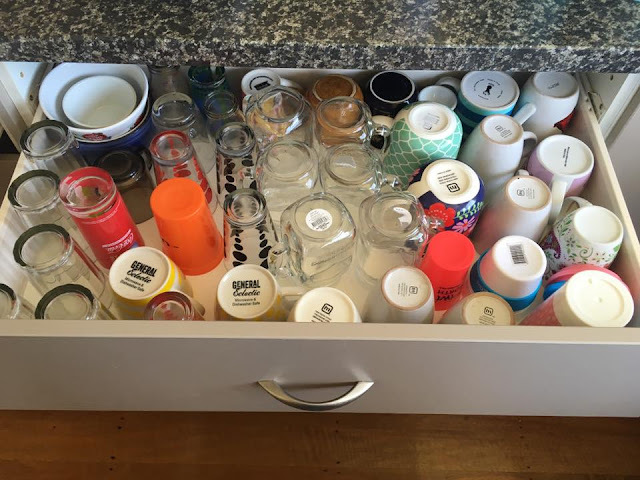 It wasn't much of a purge, however our cup drawer is looking MUCH better now, I have organised it. It sparks joy every time I open the drawer. Please note: We do own wine/beer glasses, however that is more my partner's domain, as I don't drink. I have a set of 6 coloured-stem wine glasses in another cupboard that I bring out for special occasions for family and friends to use, the rest belong to my partner. I will give him the job of going through them and purge the ones he no longer wants or needs. So much better, don't you think! Look at all that space! 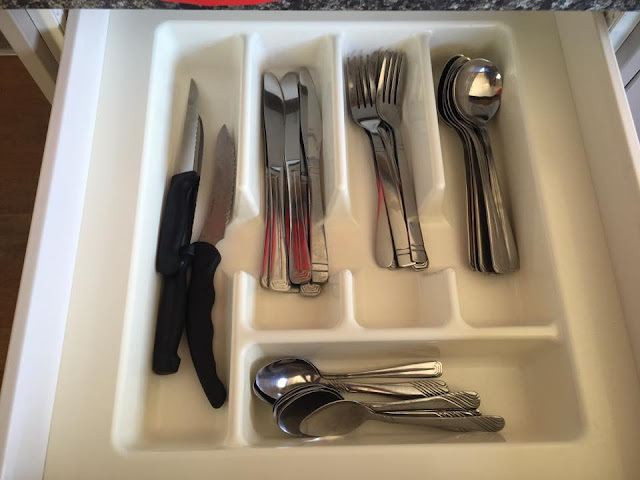 I wasn't too bothered about my cutlery and only purged a few of each item - mainly ones that were mismatched (tad OCD)...Our cutlery drawer looks much better now though. I had good intentions when I decided to keep the extra sets of cutlery. I thought we could use them when we had our families over for lunch/dinner or for special occasions. Well, we have had about 5-6 get togethers in the past 6 months (Christmas and birthdays) and we didn't use them once, so they are gone - ALL GONE. 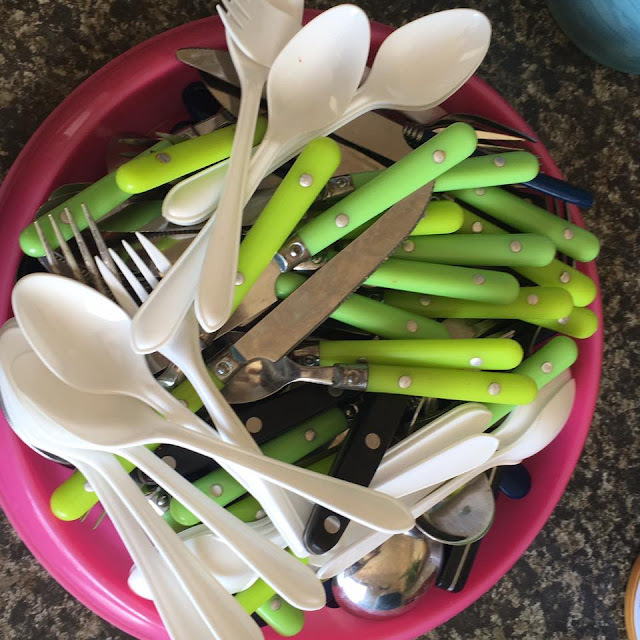 We buy paper/plastic plates and cutlery instead, and discard them once we are finished with them. For me, it just seemed pointless to keep these excess items 'just in case or just because' - they were taking up space and collecting dust. I know someone else will benefit from them. 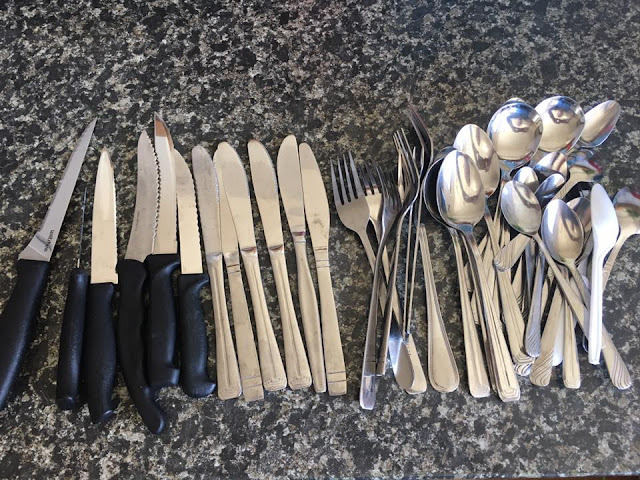 The extra set of cutlery I got from the dinner set I bought are unused, so I will donating them to our PlayCentre. 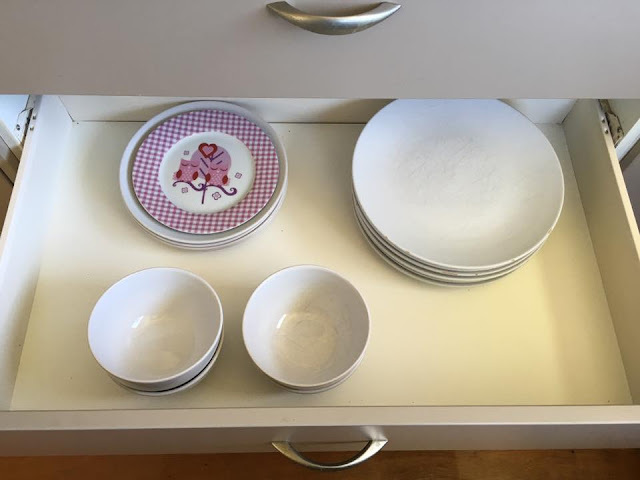 I didn't need to do much to our plates & bowls drawer, because we have kept it pretty simple since buying the new dinner set. 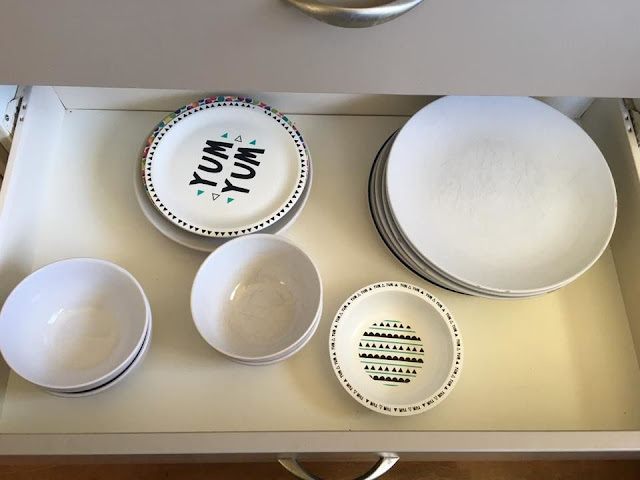 I have moved my son's plates into our plastics drawer, where we keep the rest of his plates & bowls. (There was nothing that need to be purged in that area). Well, for me, that was a good start to the Kitchen Komono. We don't actually own that much in this sub-category, so it did make the process a lot easier. 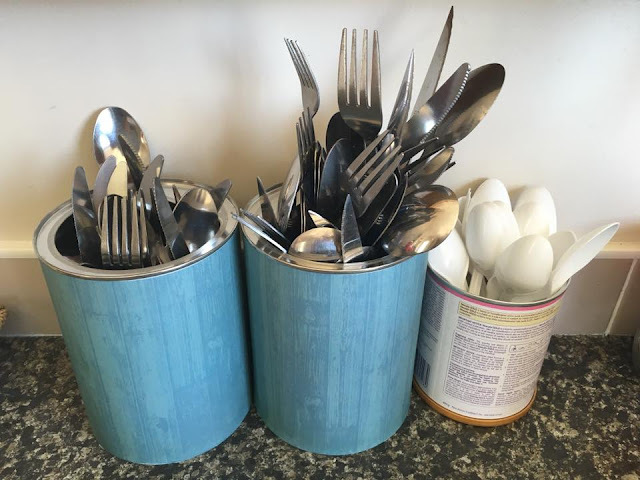 If you do own a lot of cups, glasses, cutlery and plates etc, my advice would be to tackle each group separately, pull everything out of the cupboard and/or drawer and only return the things you love, or spark joy. I used to pick out and look for the things I didn't want first, and found myself feeling overwhelmed. 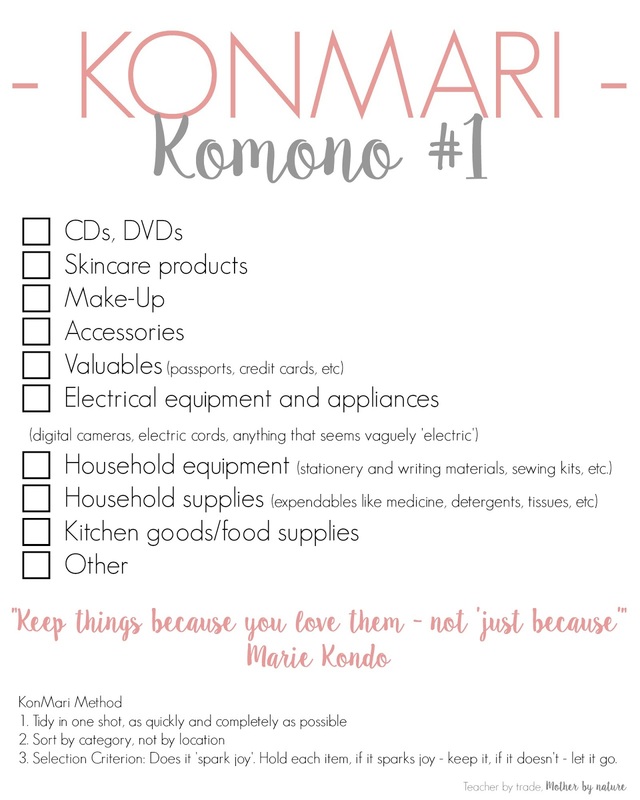 By choosing the things you want to keep first, you are then left with the things you no longer want or need. Thus, making the purging process easier. Good luck! Let me know how you get on. Do you own a lot of cups & glassware? Dishes? Do you own a spare set of plates & cutlery for special occasions? How/Where do you store them? This will include cooking utensils, cooking vessels (pots & pans), cooking appliances, and I will be including my Baking Supplies in this section too - anything related to cooking/baking. How on earth do you manage with only six plates and bowls?!?!?! There's four of us, we have TWELVE of everything and we've been known to run out. (I only run the dishwasher once a day) We started out with ten of everything in our last set of dishes but gravity and boys and we got down to seven dinner plates when, after I had to eat dinner on two side plates, we got new dishes. ha! It surprised me too, having only six plates etc...but it works for us and it helped lighten the load when washing the dishes. When we had a lot of plates, there were a lot of dishes!! What a great job or pairing down. 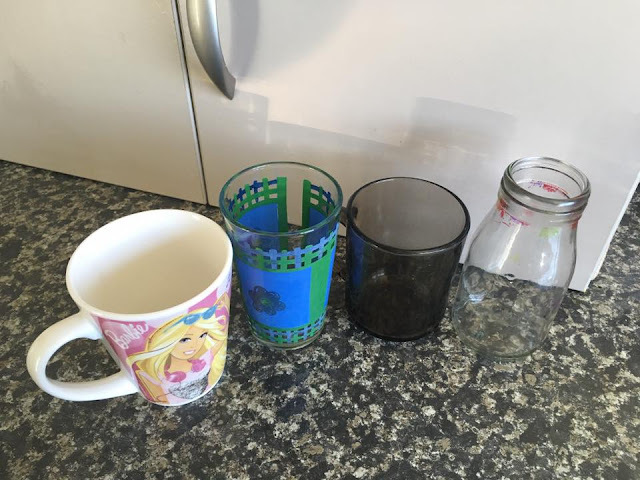 I don't have a lot of dishes, but our cups and glasses are out of control and could probably use a purge. I look forward to your next post! Let me know if you do a purge Mary! Would love to know how many you get rid of. Thanks for your ongoing support & words of encouragement. he he Thanks Shannon. It really is life-changing. I am feeling lighter already. Can't wait to see your new kitchen Nicole! No doubt it's going to be amazing! I really need to get stuck into our kitchen. Even though we are only 2 people, we have enough plates, cups and glasses to feed an army. I've got this irrational fear that one day we might have to entertain a crowd and there won't be plates to eat off, or worse still, a wine glass to drink out of... Crazy, I know! I love the idea of paper plates and of course, plastic glasses! You did good! Come and sort my stuff out - My kitchen ids a mess and I hate the thought of doing it. Yours looks great. You're doing so well Charlene. I still have to clear out clutter from my kitchen. School holidays doesn't seem the perfect time to do it so hopefully I can tackle it when Esther goes back to school. Even if you don't get rid of much, knowing that you have sorted the items and only kept what you want to have will 'spark joy'. 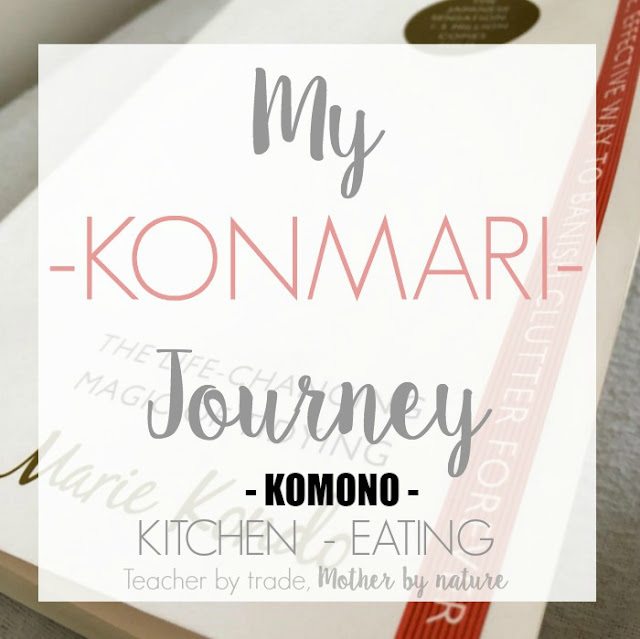 This is quite a long journey you are on, thanks for sharing it with the Blog Fair.